Ãbleskiver, have you ever heard of it? Maybe you’ve seen it spelled more “American” as ableskiver, aebleskiver, or ebleskiver. Ãbleskiver is a delightful Danish fluffy pancake-like ball.Â These pancake balls can be filled with chopped apples or your favorite jam, and enjoyed sprinkled with a little powdered sugar. 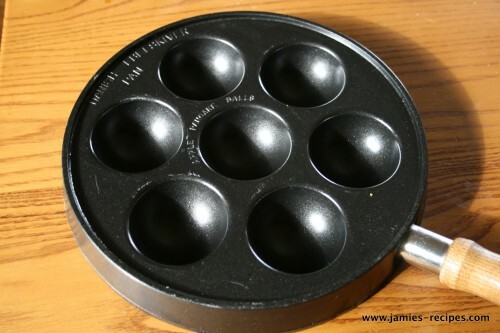 Before you get excited about this Danish breakfast treat, I must let you know that you have to have a special Ãbleskiver pan. Ãbleskiver pans have several half-circles which you pour in your batter and fry that side first. Then using a skewer or knitting needle you flip them over to fry up the other side. For years I have been wanting a pan, and within 10 months I have been gifted two (thanks Mom & Grandma!). Below are pictures of what my two pans look like. With Fall in the air and Thanksgiving right around the corner, I have been seeing lots of recipes featuring pumpkin pop up. Nicole from Pinch My Salt made pumpkin cake doughnuts that I could not get out of my mind. I have made yeast doughnuts before, and have always wanted to try my hand at making cake doughnuts. Unfortunately, one needs to plan ahead if one wants cake doughnuts for breakfast. This is where the idea for pumpkin Ãbleskivers was born. Ãbleskivers don’t require all the time that is required for doughnut making, but taste just as wonderful. 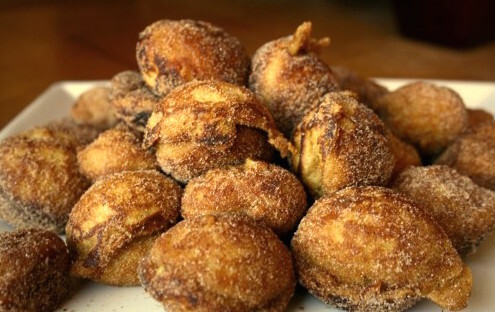 Instead of dusting them with powdered sugar, I rolled them in a sugar, cinnamon, cloves, and nutmeg mixture. I served the pumpkin Ãbleskivers with a dollop up whipped cream. I hope my Danish ancestors would be proud of my adaptation. Stir together egg yolks, pumpkin puree, melted butter, and butter milk. Slowly add the wet ingredients to the dry ingredients. Stir until combined. Beat egg whites together until stiff peaks form. Gently fold egg whites in to the batter. 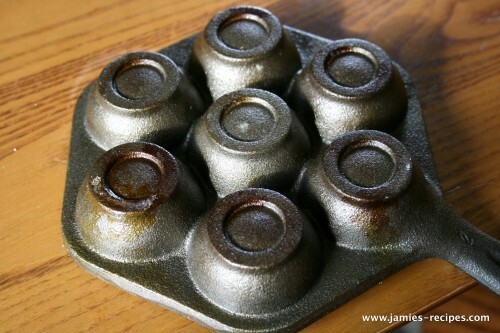 Over medium-medium high heat preheat your Ãbleskiver pan. Pour a little oil into each cup. Add about 1-2 T of the pumpkin batter to each cup. 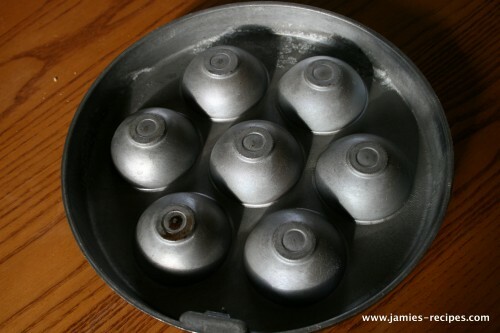 Cook for about 2 minutes, then using a skewer or knitting needle turn each Ãbleskiver over. Cook for another 2 minutes, until both sides are golden brown. Remove to paper towel lined plate. Toss with sugar mixture. Serve with a dollop of whipped cream. ENJOY! 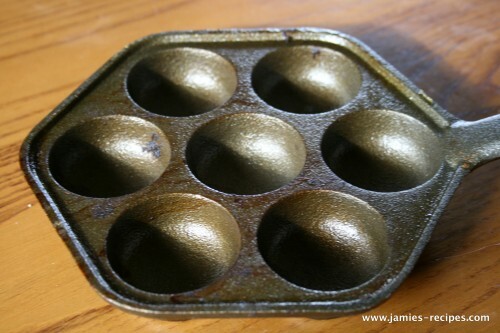 I just saw one of these pans at Willams-Sonoma and thought they looked delicious!! They have about 13 different recipes on their website if you’re looking for more ideas. If you do a search they spell it ebelskiver. This is definitely something I want to try some day!!! Looks good. Mmmmmmmmm. Hope you get good use out of your pan. Yum Jamie! My junior year roommate was half Danish, so she gifted me a pan way back then and taught me the right way to turn them with that little pin. But… I’ve never tried pumpkin flavor – I’ll have to do that – thanks for the recipe! i don’t think i should buy any more kitchen appliances, but those look delish.